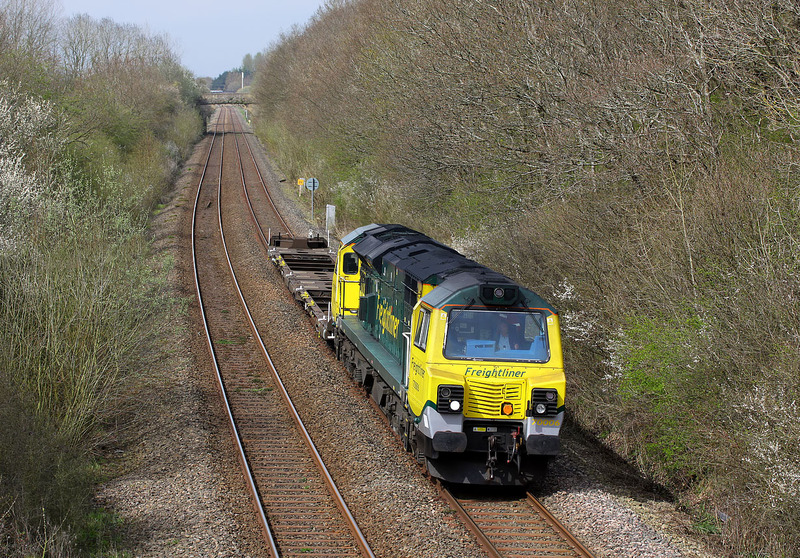 70006 passes Churchill Heath (just south of Kingham) in some unexpected, but very welcome spring sunshine on 21 April 2016 with the 6O33 12:06 Honeybourne Sidings (actually Long Marston) to Southampton Maritime, conveying just two freightliner flats. This was running 18 minutes early, which was very fortunate, as it was a lot cloudier at its booked time. In the old days a much smaller class of loco would have been used for such a featherweight train, but of course now there is only a very limited choice of motive power, so it has to be a 3,000+ bhp loco. It still seems a bit over the top, especially for the light engine move earlier in the day from Southampton to Long Marston! As far I know, this is the first visit of a Freightliner Class 70 to the Cotswold Line.